We hope that you find the compatible products table useful, like most things however, it is not without its limitations. We would recommend that you use it as a starting point, this coupled with the following comments on our main product families will assist you in obtaining the correct fitment configurations for the application. If there is something that you feel is not covered in the following recommendations then please email us by using the contact facility on the website. We will be straight back to you with an answer. If we feel that the point raised is appropriate to a wider audience we will update our advice and recommendations to accommodate it. We would always recommend that the mounting brackets are sited as low down as possible on both the front and rear of the mudguard, this reduces the possibility of flexing. An ideal position for the wing stay would be no higher than 350mm from the bottom edge of the mudguard. All types of fixings work with thermoplastic mudguards, however we would always recommend the IT bracket due to its lightweight, great aesthetics and corrosion free properties. steel mudguard. Steel fixings can be used, whether it be a standard saddle and backplate, U-bolt or EC bracket. Again we recommend the fitment as low down the mudguard as possible. The ideal fixing would be the IT-HD bracket as the load is spread over a greater area. Use a minimum of four fixing points. One on each end curve as low down as possible, and two fixing points equally spaced on the centre (flat) section. 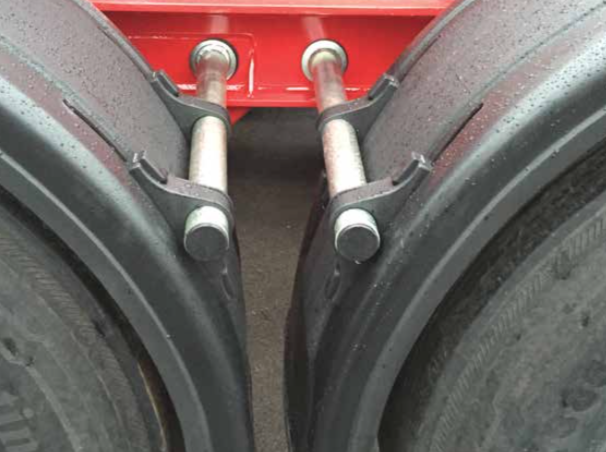 For flat sections spanning tri-axle configurations an additional fixing point should be considered. For the recommended fixings please refer to the advice given previously for each material type. Despite the growing popularity of single bolt arms in general use, we would ask you to bear in mind that they were originally designed and manufactured for use by Trailer Builders to mount lightweight super single thermoplastic mudguards. bolt arms were not designed to go beyond 700mm in length and a tube diameter of 42mm, or carry anything other than thermoplastic mudguards. Single bolt arms do offer advantages as previously stated, but we could not recommend them for use if the required length exceeds 700mm or they are intended to mount a steel or GRP mudguard. The recommended torque setting for our single bolt arms is 203N/M. Do not cut or alter the Arm mounting surface in any way, as reduced surface coverage will cause undue stress on the Arm. Suitable for use in all mudguard mounting applications. As a general guide the longer the required arm, a larger diameter tube should be used. As guidance we ask you to consider a minimum tube diameter of 42mm for all mudguards over 570mm wide. We would certainly not recommend a tube diameter less than 42mm for any mudguard over 620mm wide. Do not cut or alter the Arm mounting surface in any way, as reduced surface coverage will cause undue stress on the Arm. Irrespective of the compatible fitment chart please adhere to the following recommendation when fitting brackets to Tractor Units. Do not fit single bolt arms, also larger diameter tubes are recommended due to the increased vibration and demands of use. Single wheel mudguards – 42mm diameter minimum. Twin axle mudguards – 48mm diameter. Do not cut or alter the Arm mounting surface in any way, as reduced surface coverage will cause undue stress on the Arm. ensure that the width of the flap is at least as wide as the full width of the tyre or tyre combination. The only time that it is permissible for the flap to cover just the width of the tyre tread is once it is inside a mudguard. Over the years we have received numerous phone calls from customers informing us that ’local testing stations had failed a vehicle because the law regarding mudflap width had changed’. It hadn’t, quite simply the test stations were applying the regulations that were originally set in 1985 in the British Standard, and subsequent EC Directive. For full fitment dimensional criteria of spray suppression equipment please refer to the ’fitment criteria’ section. is done so out of preference and therefore there are no mandatory regulations regarding sizing or positioning etc.